The music curriculum is intended to meet the general needs of liberal arts students while providing students interested in a music major or minor with the skills needed to excel in their area of concentration—performance, education, history, composition. In keeping with a liberal arts philosophy, the department encourages interested students campus-wide to participate in its varied ensembles. Curriculum also combines theory and practice to provide students majoring in music with the necessary skills to excel in their area of concentration (performance, composition, history, bluegrass). Acknowledging the need to examine the contributions of various cultures, the curriculum exposes students to a broad spectrum of musical influences (western European, jazz, world music, American folk, African- American, computer music). In addition, individual ensembles are designed to meet the students' musical needs while providing a positive educational experience. Private instruction (instrumental, vocal and composition) is intended for those students desiring to raise their musical skills to a higher level. 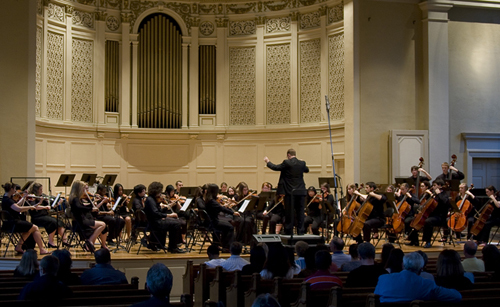 The department also generates or sponsors concerts throughout the academic year to make music an important aspect of life at Denison. Are you interested in further information about Music at Denison? Please complete the Prospective Student Form and a representative from the Music Department will contact you to assist with any questions you may have.